The Firemax 2 Litre Foam fire Extinguisher (ABF) with a fire rating for Class A, B and F is the latest generation in fire fighting technology. Capable of extinguishing combustibles such as paper and wood (Class A) as well as flammable liquids such as petrol or diesel (Class B), this amazing fire extinguisher now has a special additive to allow it to tackle cooking fats and oils (Class F). With such outstanding coverage this model is ideal if you are looking to buy a fire extinguisher for use in the home, on boats, caravans, camping or in kitchens. 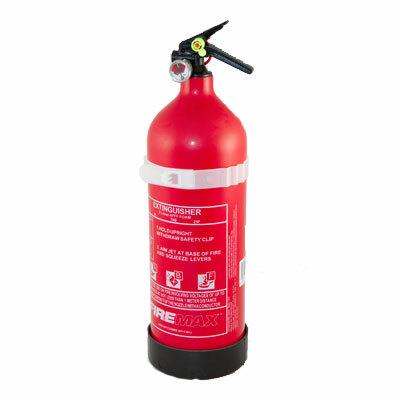 The 2 litre foam fire extinguisher is manufactured in the EU from high grade aluminium and conforms to all regulations including BS EN3, BAFE and is CE Kite Marked as well as having MED approval for marine use. Supplied complete with bracket for easy installation. This 2 litre model now has a 25F Class F rating for tackling fires involving cooking oils and fats used in deep fat fryers. Foam Fire extinguishers are multi-purpose models that are recommended for use on Class A fires involving fuel elements such as paper, cloth or wood. They are also suitable for use on class B (flammable liquids) fires. It is recommended to have CO2 fire extinguisher alongside Foam extinguishers in office environments, shops and factory locations. AFFF foam works by sealing the fire and thus extinguishing it. They then seal in any potentially harmful vapours and help prevent the fire from re-igniting. Please note that foam extinguishers are not suitable for use on electrical fires involving things such as computers or machinery. They are equipped with a special nozzle allowing them to be used close to such fire hazards but care should still be taken when operating to avoid an electrical shock. We would also recommend considering a foam fire extinguisher as part of a home safety plan as they are lighter yet have the same fire rating as a water extinguisher.